In the history of design many small companies took an active part in the growth and development of the made in Italy, one of these is Kappa salotti. It was the seventies (precisely 1974) when Edoardo Cappellini decided to open his own company, after a long experience in the field. The factory grows during the years, the manufacturing area develops and the selection of products inside the exhibitions increases, boosting the sales volume. The image and design are further reinforced by the partnership with Passerini & Partners Architetti Associati, sooner becoming one of the most attractive realities due to the relationship between price, quality and service. In the last years Kappa salotti has successfully reached internationals markets, exporting the Italian design and artisan quality. Kappa salotti has preserved its lively image of leader company, always attentive to international trends, since the first edition of “Salone Internazionale del Mobile”, that took place 30 years ago. In the last few years it has designed concrete products of good finish and design, as an added value. - Reception with operations office, sales office, administrative office and research and development office. 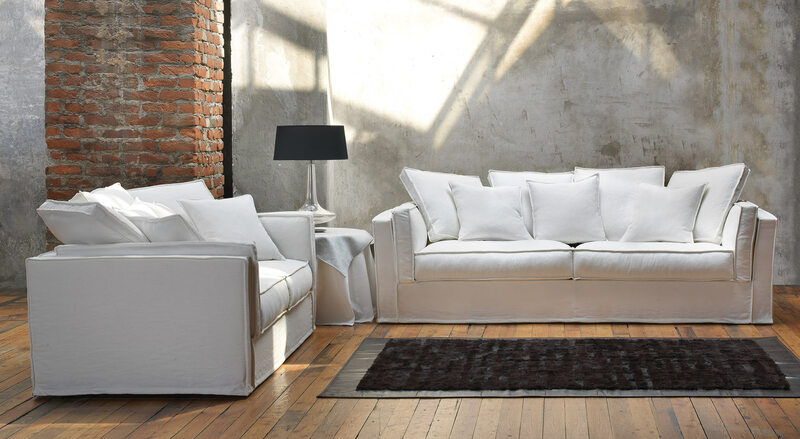 - Passage to reach the throbbing heart of the company: the manufacturing area where highly skilled personnel sews, cuts, upholsters and prepares with care and competence sofas, armchairs and beds. - A wide showroom which shows present and trendy compositions; from fine leather to cotton canvas, from linen to velvet and chenille.Whit volumetric cuts the products create real set where the interpretation of the sitting room is immediate, precise and with great scenographic effect. The advantage of the showroom is the possibility to see the complete selection of products, which allows to notice the details and the encumbrances that otherwise would be perceived with some difficulty.